Ghosts of Venice (GOV) a Mixed-Reality Film realized by Mark Melnykowycz, Marco Gatti and Sara Mautino, is an application for mobile and wearable devices. 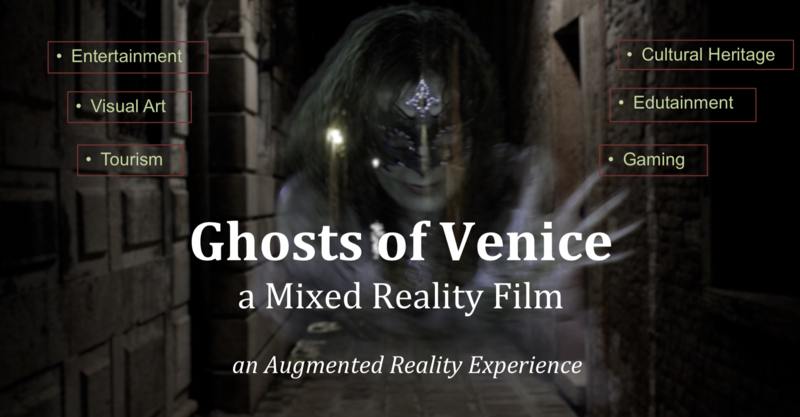 Combining storytelling with beacons and augmented reality, GOV provides the audience with a new form of entertainment and active learning, intertwined with the exploration of physical locations within the city of Venice, which is at the same time a very real place and a place of mystery and fascination. GOV gives the audience the chance to explore Venice by following several ghost stories inspired by local myths and legends. These stories include protagonists with both historical personalities and average human beings, and tell stories from the black chronicles of the time, as well as popular tales. Each ghost story is related to locations, buildings, objects, museums and churches that people traditionally visit and explore. During the day the audience indirectly builds each character’s background through interaction with the environment, i.e. graphical, textual and audio information which is location-based. At night, users have access to the full experience of the vision of the ghost, who is discovered and revealed in the same place where it had once been imprisoned. GOV is realized through the adoption of Augmented Reality (AR) technologies, namely, its potential in enabling experiences with a stunning power of expression and spectacular suggestion. Ghosts are represented as video elements that are positioned in the environment or projected onto architectural features, creating seamless integration with the city and the night. This “augmentation” of the environment, itself created from reality, represents the future, an evolution of audio-visual entertainment.